Horse stall mat, vinyl coin matting and closed cell foam make a good sound damping combination over the factory wood floor of the van. Flanged l-track holds the three layers in place. We painted the metal van floor and reinstalled the wood floor with some closed-cell foam underneath it. That wasn’t enough insulation though. For a combination of heat and sound insulation, we went with a layer of closed cell foam (Low-E foil faced 1/8″ foam), 3/8″ rubber stall mat and 2mm (~1/16″) hard-wearing non-slip vinyl coin-grip flooring. Each of these layers serves a different purpose. The closed cell foam is a heat insulation layer and it also lets the stall mat float freely above it. This makes the stall mat into a great sound dampening layer. Car audio fanatics use mass loaded vinyl in a similar way. The stall mat has a similar density to mass loaded vinyl but is much thicker. The non-slip vinyl layer on the top provides some protection for the floor and is more visually appealing than the rubber stall mat. All of these products come in four foot widths, but the van floor is around six feet wide. To hold the three layers down without needing to glue them in, which would ruin the sound dampening effect, we ran strips of l-track from the front to the back of the van about 12″ in from each wall. This lines up really nicely with one of the raised areas in the metal floor. 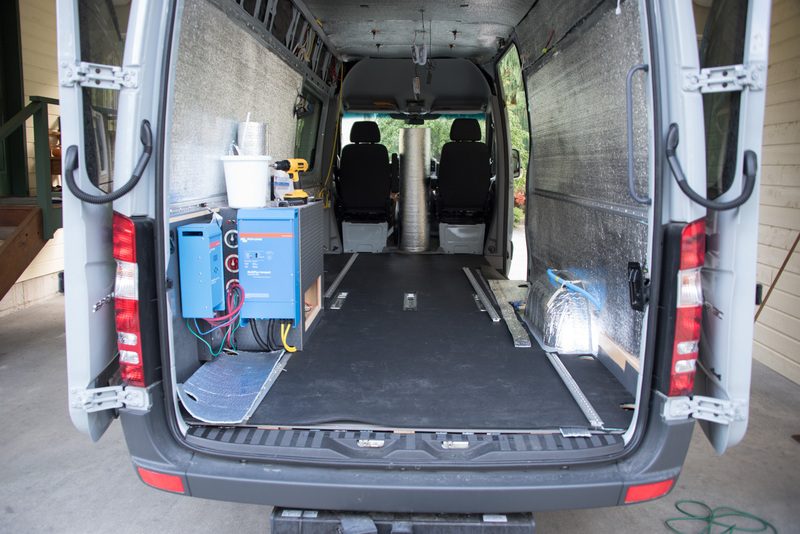 You can get l-track installed in the van from the factory, but that is recessed into the wooden floor and glued in place. We wanted our l-track to sit on top of the wooden floor. The space behind the flanges is 1/2″. That’s just right for the three layers of flooring material we are using when they are compressed together. The flanges of the l-track hold the layers in place really firmly. 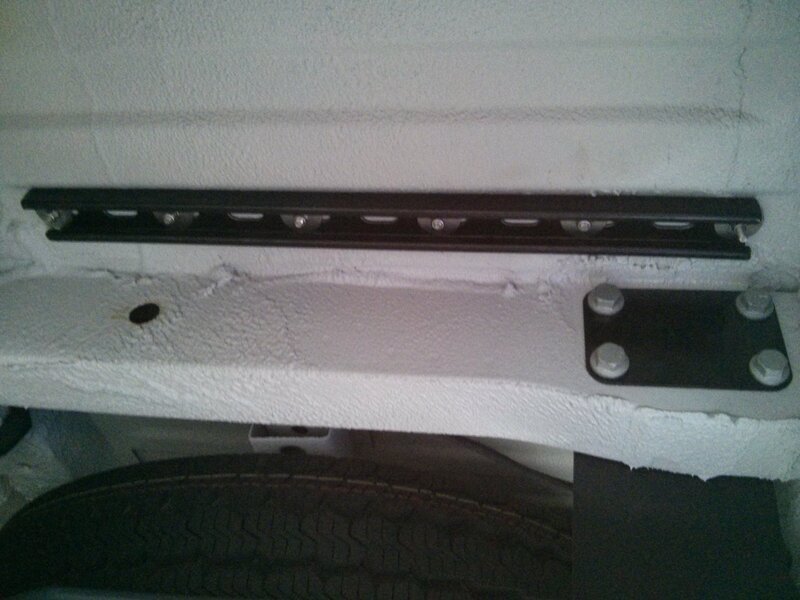 We bolted the l-track through the wooden floor, through the metal base of the van, and through Unistrut steel channel under the van to add strength to the bolts and also to provide a mounting point for anything we want to attach under the van. The floor feels firm to walk on but slightly cushioned. It cuts down considerably on the road noise coming in to the van. There are some wrinkles in the top coin layer from where it was rolled up so tightly but they are smoothing out as we use the van. I’m upfitting a 2015 144 (in Portland) Where did you get your coin flooring? Thought about using garage floor vinyl coin flooring. I got the coin flooring from Amazon. It ended up being the cheapest place when you factor in shipping. The stuff I bought does not have the felted back, but it glues down just fine. I used 3M 80 spray glue when I was gluing it to cabinetry. The floor is not glued down. Great job! Appreciate your website as I am planning a future DIY. I’ve saved your website to my reading list. Are you an electrical engineer? I feel comfortable doing most of it except for the electrical planning. I’m planning this next year to purchase a 170 wb 4×4, what features would you strongly recommend from the factory? I see that you recommend the blind spot alert, I didn’t know about the seats being a air cushion as a factory option either, do they come with rotating base from factory too? Do you know if I order a cargo van if I can customize the windows? Thanks for sharing! I’m not an electrical engineer. I had done house and vehicle wiring before starting the van but I had to do a lot of research into the right components to use and how they all fit together. There are lots of helpful people, including some electrical engineers, on the Sprinter forum. I’ve written a bit about choosing the right van options. You can no longer get the factory suspension seats, apparently because they interfere with the airbags that Mercedes now puts inside the seats. 2015 was the last year that the factory suspension seats were available. I think that also prevents you from getting the factory-installed swivel seats, but I’m not sure. If you work with a good dealer, you can add windows to a cargo van. However, it’s also possible to add aftermarket windows by cutting holes in the metal panels if you prefer. That allows you to have vents in the windows that open for more airflow. Huge fan of the site – very interested in mimicking most of your setup, particularly the interior and your electrical system. I currently have a 2016 170″ 2500 “Worker” (no factory floor installed) and am looking to copy your floor setup. In your opinion, is the wood “subfloor” in your van necessary for rigidity of the floor/does it assist in keeping the horse stall matting and vinyl coin from wrinkling and possibly slipping out from under the L-Track? In other words, do you think I could install the same combo (Low-E, matting, coin) on top of a polyiso/spray foam combo laid onto my metal floor or should I put in a plywood subfloor to keep things rigid? Last question, is the L-Track alone sufficient to keep the flooring in place or do you recommend any additional fasteners (perhaps the D-Rings with longer bolts) to keep the flooring in place near the walls? I don’t think the wooden layer is absolutely essential in the van. The stall mat is strong enough to prevent anything from puncturing it. The wood layer *might* be better at protecting the floor if you happened to drop something heavy and pointy on it. You could install the low-E, stall mat, and coin on to a polyiso board layer. However, you’d need to find a way to securely attach the l-track. I would not personally trust the l-track if it was just rested on/bolted through the layer of polyiso. I imagine you’d need a solid strip of material under the l-track. Our flooring stays in place with the l-track and a couple of the D-rings. We also have edging strips at the rear and sliding door and at the back of the cab floor area. The coin layer does move a little in hot weather, but it’s not been an issue for us. Ah yes, I forgot to think about the L-Track and how it might sink into the polyiso without some sort of rigid piece underneath. Might be worth the hassle to just make a subfloor rather than try to flush mount some kind of rigid piece of material under the L-Track. If you are looking for heat insulation more than noise insulation, the polyiso layer is a great idea. Our floor still gets cold in the winter. A 1″ polyiso layer would probably help considerably. Like you say though, creating 1″ deep rigid strips to lie beneath the l-track could be hassle. Eric, we used metric M6 size flat head countersunk bolts. If you are using imperial size ones, the L-track you can buy in the US is normally drilled for 1/4″ bolts. Be aware that the default countersink angle is different for metric bolts and imperial bolts. Either you use imperial, try and find metric with the right countersink angle, or just go for it with whatever metric bolts you find. The length of bolt you need will depend on how you mount your L-track, and even what brand and style of track you buy. For instance, some of the discount L-track has a much thinner base. We mounted our L-track over the factory floor, with a 1/8″ layer of foam under the factory floor. For that, we used 40mm length bolts. That gave us just enough room for the Unistrut, a fender washer, and a nyloc nut under the van. We drilled through the ridges in the floor that point up, not down. If you had to use the downward pointing ones for your attachment, you’d obviously need longer bolts. Be sure to only use stainless steel bolts, nuts, and washers. Tighten them by hand rather than using a drill-driver, and use an anti-seize paste or at least a good grease in the countersink area of the bolt head and on the bolt threads. Stainless steel has a tendency to gall, which makes it lock together in a way that you just can’t get it undone if you aren’t careful when you assemble it. Great site! So much useful and well organized information. I also appreciate all of your input over at the sprinter forum. We are planning on using a lot of your ideas in our upcoming build, particularly the L track based walls and floor as well as your seat/bed configuration. In regards to your flooring, you mention that the van floor does still get pretty cold in the winter. What would you do differently to address this issue? Possibly add an additional layer of insulation under the factory floor? We will be using our van primarily as a w Bike/Ski weekend adventure mobile based out of Colorado. So being well equipped for winter, while only a couple days at a time, is important to us. I also am 6’5 making headroom inside the van a premium. Any insight would be much appreciated. Hi Casey, if we were doing the floor over again, we might look into polyiso or styrofoam boards placed under the factory wood floor rather than stall mat placed on top. It sounds like you need heat insulation more than sound insulation, and the foam boards would be better for that. I know some folks have used electric or hydronic radiant floor pads. That would be real luxury! If you are 6’5″ tall, you have absolutely no free height (don’t you have to bend over anyway?) so almost any addition to the floor is going to eat into the available space. About the only other option you have would be to add insulation *under* the vehicle. That wouldn’t be easy, and you’d have to watch out for inadvertently covering any mechanical and electronic components, but it might be worth considering. Having said all that, although the rubber coin is cold to the touch we now use small mats over the top that act as another layer of insulation. They don’t feel cold. We aren’t exactly running around in bare feet over the winter anyway, and the Espar diesel heater keeps the van toasty warm. The heater might be slightly more efficient with better floor insulation, but it isn’t the biggest deal in the world for us. 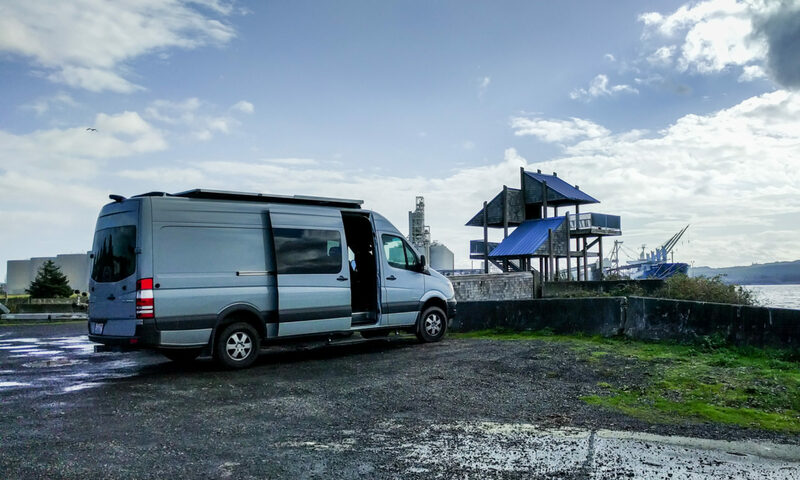 I’ve really been enjoying your write ups, and they’ve been helping me find direction in what seems like a million ways to convert a Sprinter van. I appreciate your contributions. Thank you! I have a question about the flooring for you… I’m considering using a 4lb 1/2 layer of minicell instead of the stall mat, topped with the rubber coin and held in place with L-track. I live in Alaska and I think the closed cell cross-linked polyethylene would be lighter, and probably do a better job of insulating from the cold over the mat. I’m afraid that it will be too squishy though. Comparing 4lb density minicell to the specs of stall mat, it looks like the minicell has a hardness of 70 vs 90 (out of 100) for the mat. You obviously know how the stall mat feels under your feet, so I’m wondering if you think roughly 20% less hardness would be tolerable? Thanks very much for any thoughts you might have on this! 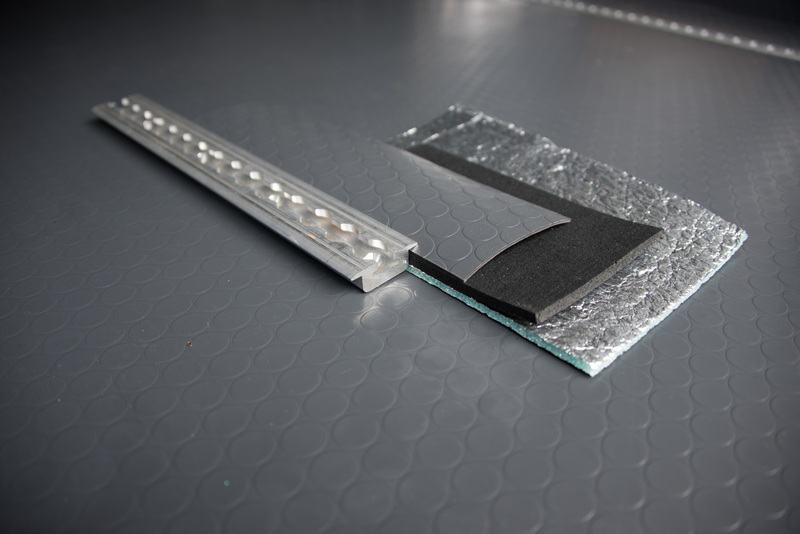 Although we like the sound deadening of the stall mat, you’re right that it doesn’t have the same heat insulation properties as other materials like Minicell. If we were doing this all over again, we might use minicell or polyiso. However, I don’t know for sure that the minicell will have enough structural rigidity/hardness to support the coin on top of it. Obviously the minicell won’t crush as such, but even our floor is slightly “soft” to stand on. If we put a heavy object down on the floor it sometimes leaves a temporary indentation. All I can say is, grab a sheet of Minicell, throw some coin over it, and walk on it in your garage or on some other solid floor for a while. I imagine it will be OK but I’ve never actually tested that combination out. How did you address the few exposed surface seams in the coin vinyl? I’m making a similar build although our coin vinyl is over 1/4inch minicell. Curious what you did at seams and how it’s holding up. Zeno, there are only two very small areas with exposed seams in the vinyl. One at the front of the van near the step, and one at the rear. We managed to line the rest of the seams up with where the L-track is recessed into the floor. We just left the seams. No glue, no caulking. We did think about putting some double-sided adhesive tape under the vinyl at those locations but it wasn’t necessary. You can just about see the seams, but they aren’t a big issue. I’m really interested in how the Minicell works out for you. Let me know how you like it. Hi Casey, no complaints. I like the softer floor that the minicell provides for kneeling on and thought it may help insulate the living space better than alternate layering. However, the coin vinyl can still be cold to the touch. My overall floor layer from bottom to top is 2mm closed cell foam (hardwood floor underlayment), 1/4″ minicell, 1/4″ plywood, 1/4″ minicell and then the same coin vinyl as Dieselfumes. Great info here! Taking delivery next week and planing my flooring and found your great write ups- Thanks! Correct above except I have no factory plywood. Also, I really like the soft floor barefoot in summer. Comfy and durable. 1. Did you install anything (insulation) under the OEM plywood floor (continuous or in just in between the factory floor ribs) ? 2. Was there any issue with your factory crew seat brackets fitting in the floor correctly after “building up” the floor? I also have a crew van and I drilled holes in the floor to gain access to the factory weld nuts in the event that I want to move/add more crew seats. It seems if you raise the floor from the factory floor height, that might present a problem with the seat brackets not being recessed the correct amount? Hopefully this makes sense and was this an issue? 3. If I don’t use L track on the floor, do you see any problems with the Low E, horse stall mat, and vinyl just “floating” and relying on the seat brackets and tie downs to hold the flooring in place? Adam, we installed insulation in the metal ribs under the factory floor. I’m not sure it’s worthwhile. The seat brackets sit directly on the factory floor, underneath the other layers. So they don’t have to accommodate the extra layers at all. We trimmed the stall mat and vinyl flooring so that the metal flanges around the seat brackets don’t show. We did put aluminum spacers under the tie-downs so that they could be placed on top of the additional floor layers. I have no idea how well the floor would stay in place with just the seat brackets and tie-downs holding it. Hopefully you’d also have aluminum strips in the doorways and even at the front of the floor just behind the cab area. My initial thoughts are that it could easily move around but if you are planning to add some permanent cabinets, that would be helpful to hold things in place. If I was doing this again, I’d use Minicell instead of the horse stall mat. It’s much lighter and has better heat insulation properties. Any instructions on building and tying in that step delete? David, there’s nothing special to the plywood box we built to fill in part of the step. We just made its height the same as the factory floor, and its length is determined by where the mid-point stop is on the sliding door. There is no “floor” in the box, and the part of it that sits against the step riser also doesn’t extend all the way down to the floor, because there’s a curve in that part of the plastic step cover. If I recall, we also had to relieve one part of the section that sits against the riser. We did that by running a circular saw blade over it a couple of times with the depth set to just a few millimeters. We bolted the box in place with a couple of bolts through the step riser. It’s been really robust. What you see in the pictures started out as our temporary prototype but we’ve never felt the need to change it.